Lawyer and Pastor Start Mobile Auto Body and Paint Company...And It's No Joke! Onsite Recon is a mobile auto body repair company offering exterior repairs (such as dent removal, paint touch ups, bumper and panel repair and painting, scratch repair and many more), and wheel repairs. All repairs are performed on-site at your home, right in your driveway! We come to you at a fraction of the cost of a body shop! With our proprietary trailer system housing everything we need, we can complete most repairs and have you back on the road in 90 minutes or less. Our mobile auto body painting service saves you time and money. Now you don't have to waste your time driving to the body shop just to receive an estimate - we can provide you an estimate via email within 1 business day. Nor will you have to deal with the hassle of losing your car for days to a body shop just to have non-collision damage repaired. By coming to you, you'll not only have more time on your hands, but you'll have more money as well. Our customers have told us that we save them around 50% on average over a traditional body shop for non-collision repairs! Our headline reads like the start of a joke, but make no mistake, it's not! Onsite Recon™ was founded by two friends and fellow entrepreneurs, Matt Harden and Steve Crabb. Each comes from different backgrounds (Matt went to law school, and Steve went to seminary), but ultimately each found their way into the automotive appearance industry. Matt and Steve have more than 10 years of experience between them, having worked for a privately held automotive reconditioning company. 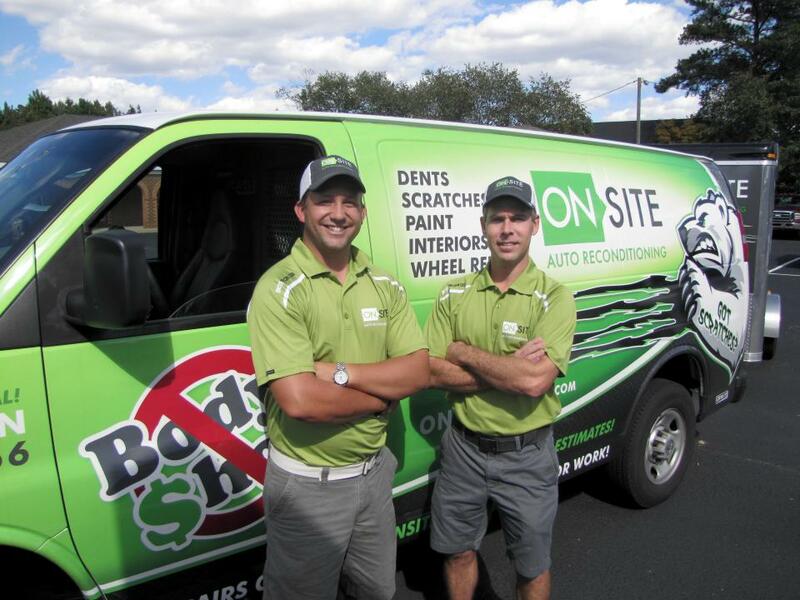 Matt and Steve founded Onsite with the express goal of making the auto body repair and painting services that dealerships have relied on for years available to the general public, all at a fraction of the cost of a body shop. Matt and Steve are intent on creating a national brand; one that people will associate with quality, character and craftsmanship - qualities not often associated with this industry. They love Seth Godin’s definition of a “brand:” “A brand is the set of expectations, memories, stories and relationships that, taken together, account for a consumer’s decision to choose one product or service over another.” http://sethgodin.typepad.com/seths_blog/2009/12/define-brand.html. Did you catch that, “expectations and memories?” Our technicians' character, like-ability, clean-cut appearance, and the quality of their craftsmanship consistently exemplified will be the building blocks of a brand that will rise above the competition. By hiring likeable, clean-cut employees, we're not only achieving our purpose, but we're creating future leaders and business owners as well. It's as easy as 1,2,3 to feel good about your car again!